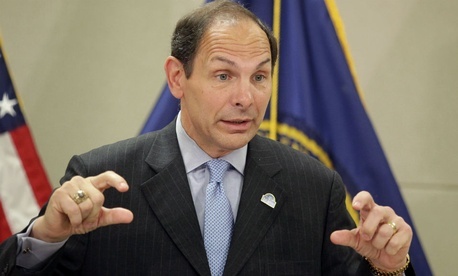 Malfeasant Veterans Affairs Department employees will be held accountable, newly sworn-in Secretary Bob McDonald said on Thursday, but the process will take time and the employees will be treated with respect. When touring a VA facility in Memphis, McDonald told reporters he could not disclose any information on who or how many senior executives would be fired in relation to the wait time and data manipulation scandal that has engulfed the agency in recent months, and said due process must be maintained. Still, McDonald said the cases must move as expeditiously as possible. A law signed by President Obama last week would allow the VA to fire or demote Senior Executive Service employees immediately. They would then have seven days to file an appeal with the Merit Systems Protection Board, which would in turn have 21 days to issue a ruling. MSPB has said the law raises major due process and logistical concerns -- currently the quasi-judicial agency with just 200 employees has 120 days to adjudicate a case. The VA scandal first came to light after employees blew the whistle on wrongdoing, and the agency has since come under fire for illegally retaliating against workers who shed light on misconduct. VA has promised to eradicate whistleblower retaliation, and McDonald said Thursday a more congenial tone may be the key to getting employees to come forward.